Buy Part TWO Print OR Kindle Edition. Part One for January 1 to June 30 – ON SALE! Buy Part ONE Print or Kindle Edition. For 2017: January 1 to June 30, compiled by June Bartz. Broadcast Daily on Acts Radio, posted Daily on South East Asia Mission Teams Devotions and other Face Book Pages. “All the words of Jesus day by day! 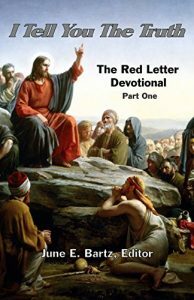 Fantastic!” These daily devotions are based upon the words of Jesus from Matthew to Revelations. Written by SEAMIST missionaries and workers, each devotion has a title, a scripture text, and a few paragraphs to consider while you meditate on the passage. Finally, each one ends with a prayer you can use to ask the Lord to help you to understand and to integrate the truths being presented. The devotions were written day by day and presented online for people everywhere first during the year 2014. They were so well received and such a blessing for some of our Facebook followers that we were encouraged to present the series again as on Acts Radio for the year 2017. Many of our friends asked for a book they could hold so we compiled and edited the entire series and they are published for both Kindle and in printed form on Amazon. Our hope and prayer is that they will be a blessing to YOU! Part Two (July 1 to December 31) will soon be available.